Style Details: I haven't been wearing as many brooches this summer due to strapless pieces, crop tops, and thin strapped tanks not really being conducive to wearing brooches. Luckily with this tee I was able to squeeze one of my beloved Erstwilder dino brooches into the outfit. I'm not one of those girls who eagerly awaits fall (I LOVE summer) but I am looking forward to more fabric for brooches in the coming months! Music Time! It was so impossible to not use "Catch a Wave" by the Beach Boys as inspiration for this blog post title! How perfect? Plus it's summer and the Beach Boys are basically the quintessential summer band! Hope everyone is having a great July! Unfortunately my posting is slower again this week. It was super adorable that in my last post I stated that this week would be more chill! I genuinely thought it would be, but opportunities arose and one thing on my calendar popped up that I thought was way later in the month...oops! If this craziness continues I'll get used to it and get back to a regular posting schedule and social media presence before August...I promise! (I'm sure a lot of you relate to the balancing act of real life plus blog/creative project life being intense at once!) In the meantime I'll be back on Friday and have a lovely rest of your week! Also...head's up...blog url may or may not be likely changing later this week ;) Stay tuned, especially on the social media handles below to catch the changes! 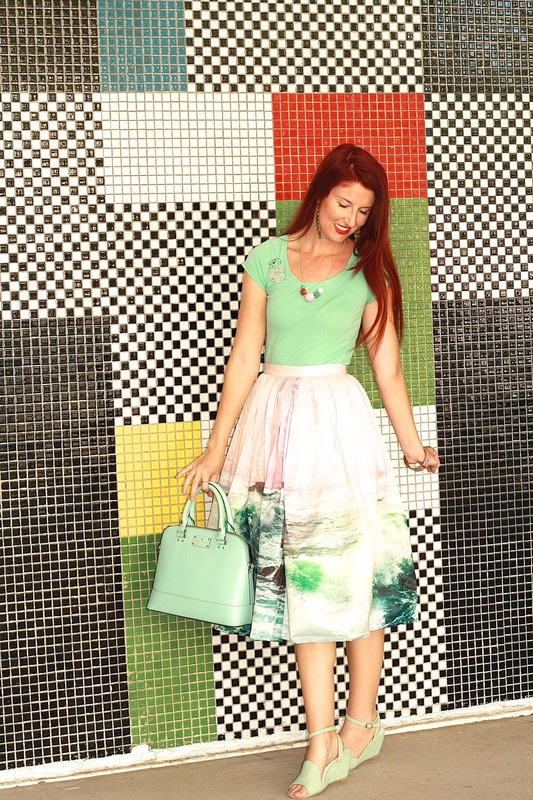 Mint is such a gorgeous color on you--especially your hair! Such a cute look!! I especially love the skirt! And cool song! This outfit is perfect! Everything matches so well - it's amazing! I really need to try Chicwish one of these days. Every time you feature a skirt from them, I tell myself that. Haha. They're always so beautiful! Absolutely love this skirt----it's like artwork for your body! Oh my, this skirt!!! I adore the ocean and anything nautical related. Chicwish is one of my favorite brands and they always have the best skirts. I do agree though that sometimes the satiny finish feels a bit more fancy, but people always comment on how gorgeous their pieces are when I wear them. I need this skirt in my life stat! So many wonderful memories tied to the ocean. Also, mint! Haha. That skirt really is fantastic! I hear you regarding the satin-y finish, though for me, I'd say that the pleats are the bigger stumbling block, as pleats + my short, hourglass figure don't always play nicely in the slightest. That said, I own a couple of their skirts so far and they're both fairly kind to me on that front, so I wouldn't per se hesitate to buy more in the future for either reason. Such an amazing skirt! And I love it with the mint top! Too cute Lauren! 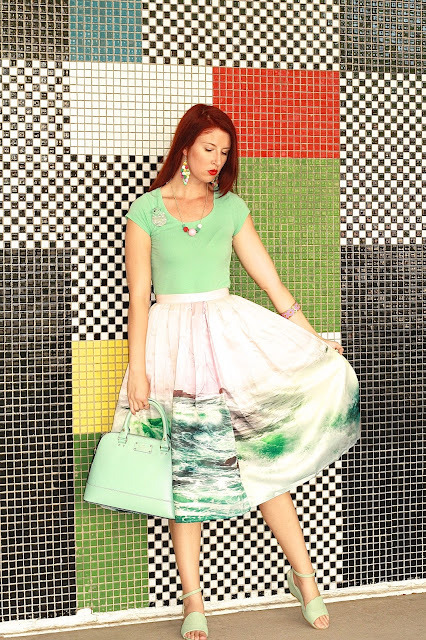 This ocean skirt is so soothing. You look so beautiful in it and your bag and shoes match so perfectly as well. Love your colorful necklace and your background. I also love the Beach Boys! Great choice.